hi fellas, last summer seems to be good for me. managed to get 1 or 2 cycle, but then the temp drops, and i got distracted with work and they're all dead now! My biggest and only problem seems to be getting them from pupae to adult, everything else is good. Coconut coir seems to do the trick as a medium, I found lots of empty shells (or whatever its called) compared with the other materials, so now its down to controlling the temp. I've built an indoor cage, around 500mmx500mmx500mm. Just wondering what size heat emitter you think would be best? 25/40/60W? certainly not bigger than that? just for reference, the temp at the most is 9 deg C.
9 deg C is low for BSF. Can you describe your system again. 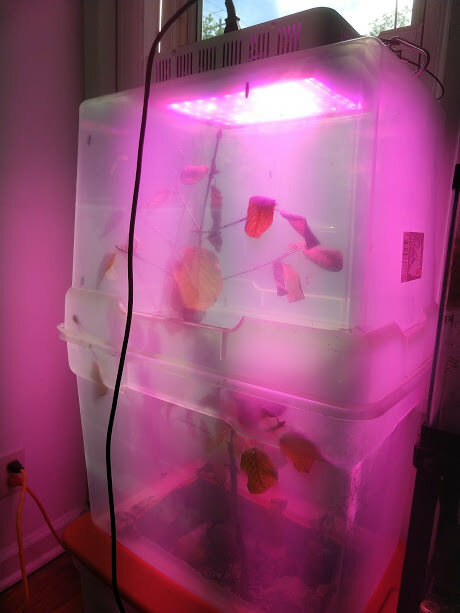 Have a look at the Small Scale Indoor Breeding topic (link) for ideas and suggestions on lighting. Depends on the thermal resistivity (insulation) of the enclosure. I would start small and see. I had an incubator made of a plastic box about the same size as what you have and had 240W of bulbs in it to keep it up around 34C. Was not very efficient. My plastic bins in the west window would warm up nice in the summer when the sun hits them. I think right now ambient afternoon temps are 22C in the room, so inside is warmer but not enough yet. Last summer afternoons in the box were often above 32, but still no eggs for some reason. Right now I think they are still too cold; I get some dancing in the afternoons but no magic yet. I am contemplating adding a heat mat with thermostat. The flies in here now were first kept in rabbit droppings. They went dormant when I put them in last November, just in the moist dirt of the plant pot. They appeared to go dormant when the temps were below 20C. I actually thought they died, and was pleasantly surprised when they recently emerged when temps stayed above 20 to 22C! I meant, during winter the temp drops to a max of 9 deg C at night. So I'm trying to find a good size heat emitter to heat it up to 25deg C, I was thinking around 40-60W? Its just a cube wooden box, using 16mm thick wood panel (off cuts from used cupboards, IKEA, etc), with one side has a 300x300mm cutout, and I'm going to install a perspex glass there with a hinge to open/close, nothing fancy. I do have another smaller setup with single plastic bin which I uses for the adult to mate and lay eggs. My plastic bins in the west window would warm up nice in the summer when the sun hits them. I think right now ambient afternoon temps are 22C in the room, so inside is warmer but not enough yet. Last summer afternoons in the box were often above 32, but still no eggs for some reason. Right now I think they are still too cold; I get some dancing in the afternoons but no magic yet. I am contemplating adding a heat mat with thermostat. ! I've got another box similar to yours, but a single one instead of double box. How many adults you've got there last summer? It could be that the space is too big, thats the advice I was given prior and changing it to smaller single bin seems to do the trick. I also kept the bins outside, so half of the bin get full sun (no artificial light needed) most of the time, and the other half is shaded in case it gets too hot, I've got eggs quite regularly. ah, probably. I have a 60W ceramic on my bearded dragon, and that's quite a bit of heat. You could put it on a thermostat too. cheap electronic controller on amazon or I took a house one that was super cheap and hacked the temp range. ok, i ended up using 40W and it seems to be fine, they're hatching to adults now. however during night time i think it still doesnt have enough heat, probably around 15 degC, unfortunately I dont have the temp logger, so I cant really tell during the dead of night. I think 60W would be better specially at night time and if you can connect it to the temp sensor where it goes off/on automatically. ... unfortunately I dont have the temp logger, so I cant really tell during the dead of night. Max/Min digital thermometers are inexpensive and available from most big box stores.